This is a nice medieval gold finger ring, dating to the 13th - 14th century A.D. It is set with the original dark green gemstone, likely an Egyptian emerald (popular during this period, after the Crusades). 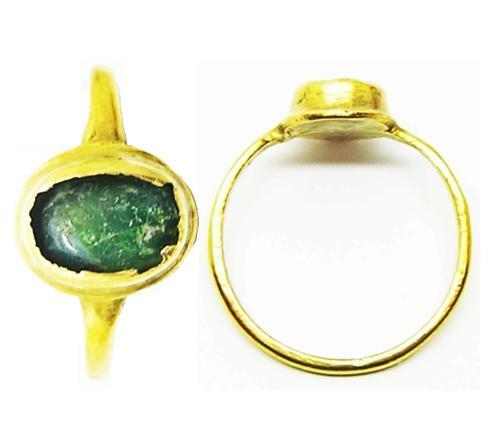 According to the Peterborough Lapidary (late 15th century English treatise on the 'Virtues' of stones and gems) the Emerald was the most precious of the green stones. It was said that to obtain emeralds they had to be stolen from griffins, that "emeralds may not be found, for great griffins hinder the coming of men by the way that leads to them... It has the gift of nature, a benefit of virtue, to save and heal many sicknesses and evils. Also Dioscorides says he (the emerald) increases riches, and makes men have good and fair words, and evidence of and cause of plea. It saves and comforts feeble sight; and he (the emerald) chastens lecherous tendencies, and makes good mind. Also whoever bears this stone (i.e. on a gold ring) emerald in a pure life, his sight will never fail him, and his colour will ever be fair, and he will be loved by all men and women, nor will he ever lose his goods, but always increase in riches and love, and it preserves from all mishaps and disasters"
We can see that to the medieval mind, this rare gem would have been a costly jewel. To own and wear such a ring during the 13th - 14th century, one would have been of noble birth or related to a knightly family (due to sumptuary laws). Such gems were eagerly sought during the Crusades, traded and taken in conquest. Today the ring has survived in excellent condition, ideal investment jewel that can still be worn with care. DATE: c. 1250 - 1350 A.D.